As you might have spotted this is a blog about making and repairing things, not about blogging or WordPress. In the process of moving the blog across from Blogger to WordPress I’ve learnt a few things which I’ll share with you below. For me there were two key factors to consider in the migration, the functionality and the content. I listed all of the components needed on the site and then looked at how to reproduce or replace them using WordPress functionality. 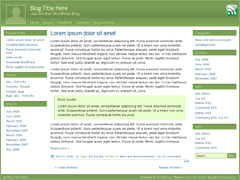 The posts were moved over using the Blogger Importer. However there were several issues that needed fixing with this. I took a development version created by Otto and systematically fixed the various issues as well as adding a few enhancements such as geotagging the posts. A similar problem existed for the images, tools existed but there were issues. The links were moved partially by hand with some assistance from the bulk import tool. The pages were rewritten by hand. When moving the blog across I did not want to lose a load of links and have 404 errors appearing all over the place so I had to learn about the permalinks and work out how the old post references could be correctly linked up to the new pages. A new user friendly 404 page was created. When I was looking for a theme one of the key features was that it would dynamically adjust to meet the available space on the readers screen. One of my complaints about a lot of themes is that they are typically A4 shaped. Until the IPad came along there were no computers that would work particularly well on. I selected Emerald Stretch by Nikolaj Masnikov and I’ve made quite a few modifications such as adding a search box, extra widget areas at the top of the page and on the footer. The gravatar linked avatar was swapped with a locally stored one and the fixed menu was swapped with a custom one, I’ve also added a new custom menu to the footer. WordPress has changed a couple of times since I found that theme so features like the new comments system had to be wired in. If you compare the screenshot with the current page you will see the changes. The post of the day was implemented to showcase particular categories. 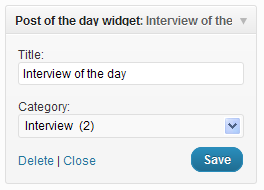 For the selected category the widget shows each of the posts in turn, one per day. The code is all in a single file so it did not need to be implemented as a separate plugin. It leverages the Get The Image plugin to show an image as many of my older posts don’t have a specific featured image. Most of the plugins on the site were found via the plugin repository on the wordpress site, I trialled different versions until I found ones I liked. A few worthy of note are “Broken Link Checker”, “Better Delete Revision”, “Better WordPress Minify” and “Redirection”. I’ve also developed a couple where there was nothing that met my requirements. 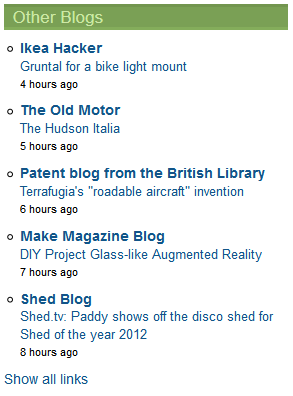 One feature that was not provided by any of the plugins I researched was the RSS links widget. I wanted my blogroll sorted by the date last updated and to show blogs that had most recently been updated, the only way of getting this information is to query the feeds and cache the top article with its date. The display is then quite straight forward. If you want to help with these widgets the best thing to do is to install them and confirm that they work ok with your system. If you want to donate then you can do so from the link below. The site was reviewed in an earlier configuration by writer and wordpress expert Lorelle VanFossen who had many sensible suggestions, most of which I’ve made to the site.